From Jacob Masi's Greek God Collection Copyright 2018. All Rights Reserved. 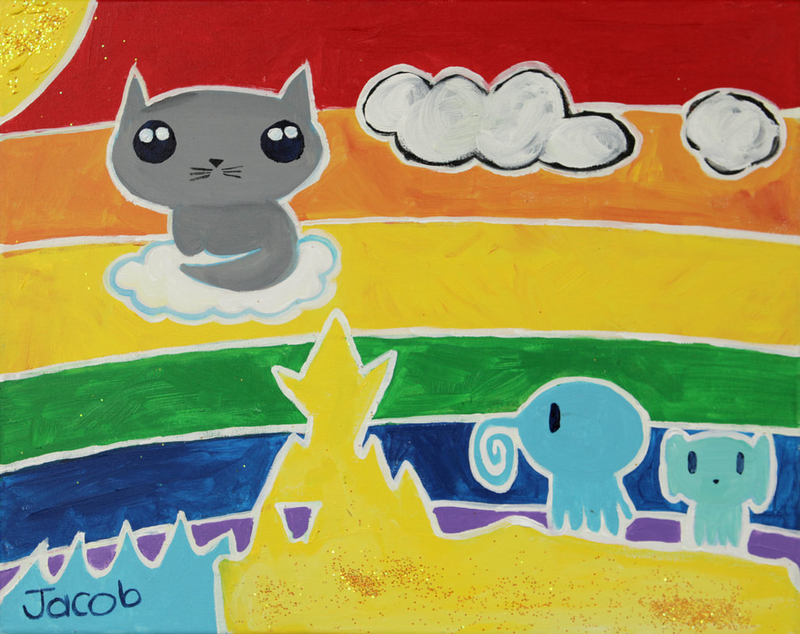 A nine year old's artistic journey that started from learning about expression and teaching his friends to painting that can inspire everyone. ​Now he is showing the world of his talents. When Jacob showed his mom his amazing drawings he made when he came home from kindergarten, she knew that her influence had been passed on. His art teacher, Mr. Delgado, encouraged him to participate in the Venice Arts Contest and he won! He has painted ever since. Now a four time winner of the Venice Arts Holiday Contest, he has his own designs for sale and is ready to enter the marketplace. For Kids by Kids!! Jacob makes paintings that are authentic and true to self. He is inspired by the many things around him and has good design sense. He gets inspiration from art, television, and movies. He then interprets and transforms them into beautiful paintings in his own style. He has been painting for almost three years. He frequently holds painting parties where he teaches and paints with his friends. They paint on canvas with acrylic paints. All of his friends love to paint with him. Jacob has developed his own style and will continue to inspire others with his unique expression. He has had three Art Shows thus far. One in a private home in 2017, at the Venice Art Crawl in 2018, and one at his home in Sept 2018. Emotions are very deep and rule rule our very interactions between human beings. Children like Jake express themselves to help them through emotional times. It is important to build good self-esteem and motivate children to do positive things in the world. What better way than to create posters that inspire and motivate. A lot of our self esteem comes from within so we have created affirmations that kids can look at in their bedrooms or stare at them and dream. Our posters come from North Carolina and are printed in the USA. Our commitment for American made is important. We make sure that everything is sourced here to give hard-working American's jobs. Our commitment to sourcing reduces our carbon footprint. Some of our products are made overseas, however in order for all products to be made here, then we need to reopen manufacturing in the United States. 99% of all apparel is made overseas, but we are committed to buying all products here and screen printing made in the USA and manufacturing here with goods purchased here. We are doing our best with what we have available. Plush toys are an amazing way to let drawings come to life. Jacob's drawings have come to life in more ways than one. We strive to create what doesn't exist, therefore producing soft toys allows us to make our imaginations run wild and be manufactured into reality. Each design is based on Jacob's original drawing. Our current line includes both people and animals. We have four categories: forest animals, ocean animals, and make believe animals. We hope you love them as much as we do. Please see our collection for purchase.